Trying to binge watch while sick with really bad food poisoning is rough; had to skip some shows I had planned to watch & skip some episodes on the shows that I did watch. I'm gonna miss having all these Funimation shows on this site; CrunchyxFuni was a really great thing for anime. Has anyone heard about any changes with anime on Yahoo View? If not, you can watch some Funimation titles there (with ads). No sign-up required. You can view the complete list of anime here. I went through my queue and wrote down all the things that I thought might be gone on the 9th. Some of the stuff in my queue I own so I don't have to worry about those at least. FUNI the benefit of the doubt (and I'm much more likely to subscribe to DISNEYFLIX). My wife and I have been happy customers since 2013 and see no reason to leave the fold now. Thank you for handling this in as kind and business-like manner as possible (even when some of us didn't react the best) The dubs on the way look great and are something new for the service. Yeah I wish there was a bit more communication, that we could all understand together what the heck is going on. I honestly don't mean to be ticked off either. Some of the titles are said to be on the list, I thoroughly enjoy. I'd hate to see them go. I wish they would have done something like just keep the old titles on there and for the beginning of the year have Funi do their own thing. Guess that's not the way it works sadly . I think it'd make a lot of anime fans and especially subscribers of Crunchy a lot happier just to leave everything be. Or maybe they could come to some kind of mutual agreement on something. I'd honestly rather stay peaceful about this myself. As I've said before, let's hope everything works out for the better. I'm sure just about everyone can agree to that. Thanks for the tip. I bookmarked the page so I can watch what I need to on there later, like the first season of Overlord. I'll probably hate the ads, but at least it's another legal way for me to watch anime other than Crunchyroll and Netflix. I know that there are other legal services that you can subscribe to, but between the two of those I have plenty of anime to watch already. The good new is apparently November 9 didn't mean at 12:01 am, per a quick check of several shows (including some that are definitely leaving). That only leaves the question of what time today they will be disappearing. The best guess would be midnight Pacific Standard Time, although I certainly wouldn't depend on that. What I'm really confused is that I noticed that a number of Funimation shows that were supposed to leave are now only available for Premium members: Assasination, Hyouka, Cowboy Bebop and Yu Yu Hakusho to name a few are still there, but free-tier members will no longer be able to watch those series. Yeah, most of the shows by FUNI are still here, right now finding out the time is a guessing game. 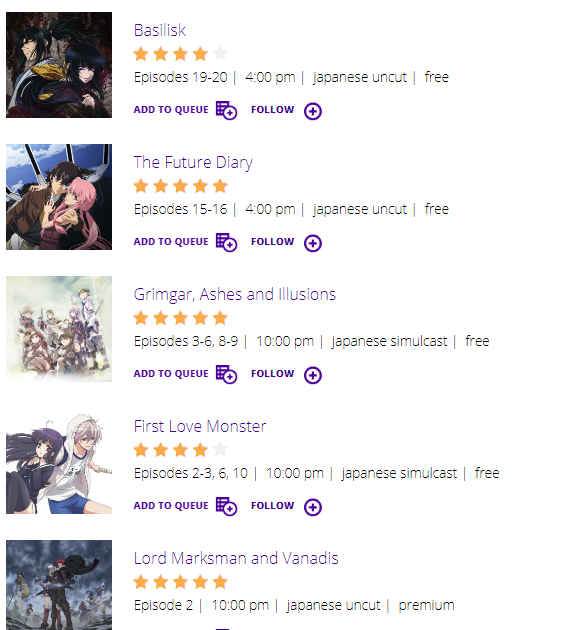 Funimation's schedule lists all their catalog stuff as going up at either 4:00 or 10:00 PM PT so I was assuming that would be the time of removal here too. That would be 13 hours from now, no? yeah for the 10 PM stuff. 4 PM is 7 hours from now.